Today is Tuesday, April 4, the 94th day of 2017 in the Gregorian calendar, with 271 days remaining. 1,388 days until the end of Donald Trump's term as President, assuming he isn't impeached. 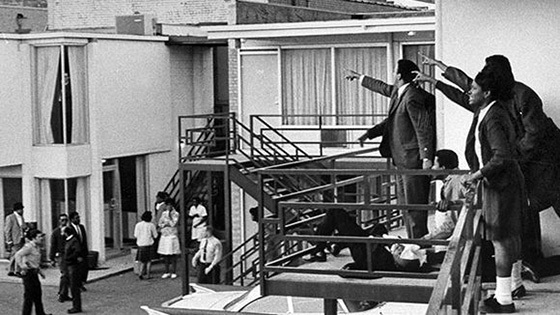 On this date in 1968, Martin Luther King Jr. was shot to death in Memphis, Tennessee. Robert F. Kennedy's impromptu speech on the death of Martin Luther King, Jr. The speech has been listed as one of the greatest in American history, ranked 17th by communications scholars in a survey of 20th century American speeches. Former U.S. Congressman and media host Joe Scarborough said that it was Kennedy's greatest speech, and was what prompted Scarborough into entering into public service. Journalist Joe Klein has called it "politics in its grandest form and highest purpose" and said that it "marked the end of an era" before American political life was taken over by consultants and pollsters. Among other things, today is also National Tell A Lie Day, or as the Trump administration calls it, Tuesday. Florida woman with condom tells cop to 'try this on for size.' In essence, a Florida woman was arrested for trying to protect a deputy. Ned Vizzini (1981-2013), American writer. "Man has made use of his intelligence; he invented stupidity." Cyborgs at work: employees getting implanted with microchips. "Of course, putting things into your body is quite a big step to do." Neil deGrasse Tyson: I'll fly to Mars with SpaceX, after Elon Musk sends his mom Yep, Tyson is one smart dude. Video: Badger buries cow carcass in Utah, shocks science world. It would have been even more shocking if he had used a shovel. Trump forgets to sign executive orders at executive order signing ceremony. As Seth Meyers observed, "Trump just wandered off like a confused bear who woke up from his hibernation too early." Regular aspirin use is associated with lower cancer mortality. Compared with non-regular aspirin use, overall mortality risk was 7 percent lower for women and 11 percent lower for men who regularly used aspirin. Cancer mortality risk was 7 percent lower for women and 15 percent lower for men who regularly used aspirin. The researchers observed benefits at dosages ranging from 0.5 standard aspirin tablets per week to seven aspirin tablets per week. Android grabs most-popular OS prize from Windows. Measurements of online activity put Android ahead of Windows for the first time; Apple's OSes place distant third. Mexico newspaper stops printing after reporter shot dead. A regional newspaper in Mexico says the violence against journalists and the lack of punishment for those responsible is forcing it to stop printing.